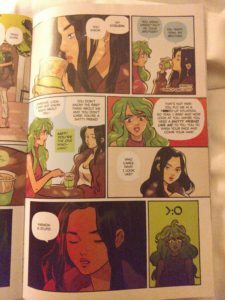 Graphic Novel Review 22/365: Snotgirl – Pull List Week! 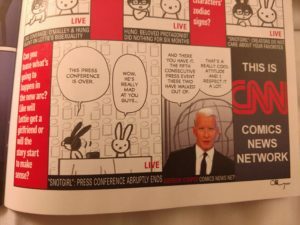 Graphic Novel Review 22/365 – Pull List Week Day 2! Please check out all of my reviews here. 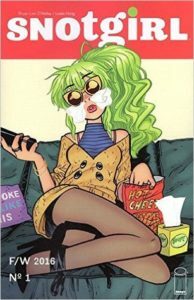 Yesterday was Archie and today’s Pull List Week title is Image Comics’ Snotgirl from the creative team of Leslie Hung and Bryan Lee O’Malley. While I’m sure most of you have heard of Archie, I’m willing to bet that a good number of the non-religious comic book readers out there might not have heard of Snotgirl, and that’s OK. That’s why you have friends that read comics, like me! This Image series is currently on issue #6, and it’s a trip. There really are quite a few balls in the air thus far in Snotgirl, and at times, I’m sort of wondering if the team even knows where things are going. BUT here’s the thing…I completely trust Hung and O’Malley, what we have so far is interesting, and the art style is super cool and stylized. These three things will have me reading until the end of this story…unless it completely falls off the rails; I don’t see that happening. If what I’ve said intrigues you, go get the book. If you don’t like fun and colors, then don’t. Just remember the 17+ rating. This might be a book for you and not your students. I think there are some outstanding aspects of this book that I will share with my graphic novel class, but I teach seniors. I’m out of time here, folks, but I’ll drop a final plug: the back matter of the book has been great.